Sophia Antipolis, France, July 10 2018 – Wrexham-based telecom service provider Pace Telecom has unveiled its new telecom services, based on the ISTRA cloud platform provided by Centile, one of Europe’s leading providers of Cloud PBX, unified communications and fixed mobile convergence for service providers and integrators. 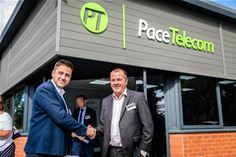 Pace Telecom gave the first public demonstration of the new services at its open day on July 9th, held at its remodelled high-tech offices in Wrexham which were officially opened Alan Cairns, the Secretary of State for Wales. July 2018 also marks Pace Telecom’s 25th anniversary. The new telecom service include cloud-based call recording and call-reporting, both introduced in direct response to feedback from Pace Telecom’s business customers and fully integrated into Centile’s ISTRA platform. Pace Telecom is also offering its customers MOBIS, Centile’s award-winning mobile app that gives Android and iOS smartphone users access to all their business communications and collaboration services, such as CRM and ERP. ISTRA supports a wide variety of services, such as PBX features, unified messaging, auto attendant, voicemail to email, boss/secretary filtering, call barring, groups management, IVRs, ACDs, audio and video conferencing with screen and file sharing, and presence. Through its integral FMC features, ISTRA also gives telecom service providers Call Line Identity (CL) for both fixed and mobile outgoing calls; convergence voicemail; mobile phone status; convergent calls history; self-care for both fixed and mobile lines; and voice call continuity.